•Note: The installation path of 20-sim 4C (e.g. C:\Program Files\20-sim 4C 2.1) will in this manual be referred to as the 20-sim 4C installation directory. 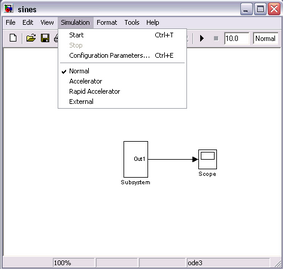 1.In Matlab, go to the 20-sim 4C installation directory and then open the 'examples/matlab' directory. Make sure the rtw_20sim4C_target.tlc is selected in the "system target file" section. If not, Click 'Browse' to select the correct file. 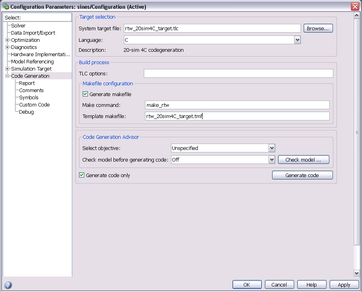 4.Click OK to close the configuration parameters dialog. 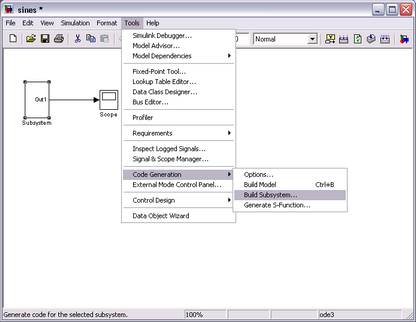 5.Select the sub model "Subsystem" you need to generate code for. 6.Go to the editor window and change the current directory to a temporary working directory as shown below. 6.Go to Tools -> Code Generation -> Build Subsystem. Make sure a sub-model is selected first, otherwise the 'Build Subsystem' option remains gray. 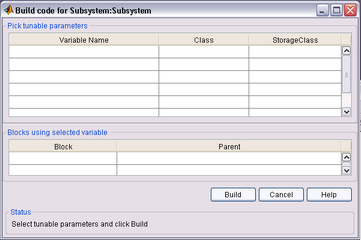 Selecting 'Build Subsystem' should open the window shown below. "Build" button will open the 20sim4C window.